Adan Cano and Kevin Giron went 3-0 in doubles Friday to lead the Desert Pines boys tennis team to a 10-8 road victory over Silverado. Alfredo Murillo and Jose Ruiz went in 2-1 in doubles play for the Jaguars, and teammate Oscar Murillo was 2-1 in singles. Seth Forstner was 3-0 in singles for Silverado. Rancho 14, Durango 4 — At Rancho, Ojis Sali went 3-0 in singles to lead the Rams over the Trailblazers. Luis Moreno-Arias was 2-0 in singles for Rancho. Anjana Dissanayaka and Andrew Alves went 3-0 in doubles play for the Rams, and the teams of Ethan Schwartz and Matthew Alighchi, and Isaac DeVicente and Josh Palabay also went 2-1. Dylan Olivier went 2-1 in singles to lead Durango. Benjamin Platerio and Gabriel went 2-1 in doubles for the Trailblazers. Coronado 15, Centennial 3 — At Coronado, Wesley Harris was 2-0 in singles as the Cougars routed the Bulldogs. Javid Habashi and Sebastian Frace went 2-0 in doubles for Coronado. Virgin Valley 12, Sunrise Mountain 0 — At Mesquite, the Bulldogs defeated the Miners by forfeit. 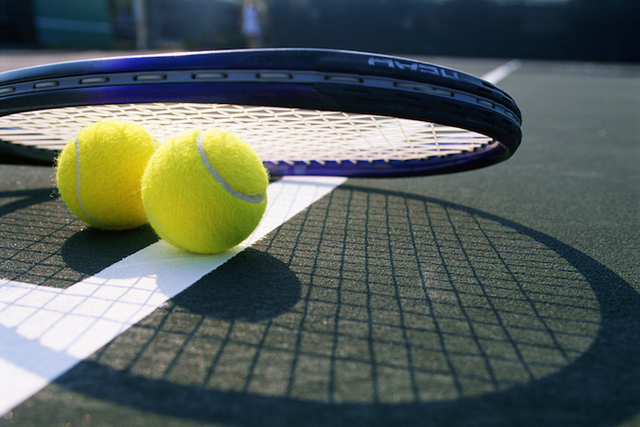 Desert Pines 10, Silverado 7 — At Silverado, Cassandra Bueno went 2-0 in singles to lead the Jaguars past the Skyhawks. Shelly Alvarado and Yazaret Arredondo went 2-0 in doubles play for Desert Pines. Lyric Ciarlo was 2-1 in singles play for Silverado. Coronado 14, Centennial 3 — At Coronado, Megan Balmer and Mana Iritani finished 2-0 in doubles as the Cougars defeated the Bulldogs. Sofia Potamitis was 1-1 in singles for Coronado. Sara Altfas went 2-1 in singles play to lead Centennial. Rancho 12, Durango 0 — At Rancho, the Rams defeated the Trailblazers by forfeit.